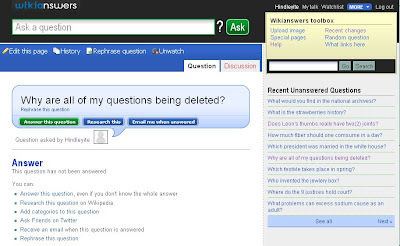 WikiAnswers is a pointless, redundant attention-grabbing scheme that should never have been created. Unless... we can somehow surreptitiously infiltrate the wiki and slip in the odd semblance of humour here and there. You know, it's just zany enough to work! Please send screengrabs of your stupid questions and join the fun! We are admirers of Jimmy Wales but must set the record straight about the recent statement on Wikia’s site that he is the “founder of Wikianswers”. Wikia’s Answers category is indeed one of thousands of wikis on its site, right between Ansible and Anthony Trollope. It started in November 2004 and had almost no activity for the past four years. By August 2007, the site had a total of 17 answers. By their launch last week, there were about 1,000. The site remains very small, despite their seeding thousands of unanswered questions last week. In June of 2004, an entrepreneur named Chris Whitten bought the domain www.wikianswers.com. He pointed it to his user-generated Q&A site, then known as FAQ Farm. A vibrant community of passionate contributors formed and did a fantastic job answering questions. By the time Chris sold FAQ Farm and wikianswers.com to us in November 2006, the site already had 280,000 questions and 200,000 answers. Shortly thereafter, we re-named the product WikiAnswers. True to Chris’ vision, our goal is to create the world’s greatest question and answer site. We are well on our way, and the numbers tell the story best: over 8,000,000 questions (35,000 new ones every day); over 3,000,000 answers (10,000 new every day); 16.5 million unique visitors in the US and 26.7 worldwide in December, according to comScore; over 2 million registered users; and over 500 volunteer supervisors. We do agree with Gil Penchina, CEO of Wikia Inc., that “there is room for many organizations to be successful in organizing human knowledge.” However, Wikia is creating market confusion by associating its Q&A category with our market-leading WikiAnswers domain and site. I would like to thank WikiAnswers founder Chris Whitten and the community that he started for their wonderful efforts building WikiAnswers. We have much to be proud of. According to comScore, by percentage growth, WikiAnswers.com was the fastest growing top 200 US domain for all of 2008. We are aware of this, as are regular readers of the Illogiblog. We have no qualms with Wiki Answers, after all it was there first. We do take issue at the Wikia version, however, which I personally think is a joke, really. Apologies for any misunderstandings, which can easily happen when this sort of commercial competition happens. Wiki Answers is no doubt like Yahoo Answers... they don't take well to musing questions, ruminations, or facetious questions. I was flagged a few times and just gave up.